You know that old saying about God laughing when you make plans? Apparently it applies to skincare and beauty beliefs as well. Else why would someone like me, who has always vowed to keep away from anything injectable/cuttable/scalpable for my face be lying flat on my back in a dermatologist’s clinic, willingly submitting to three scary-looking injections being poked into me chin and forehead? In my defence, the syringe was full of a cortisone solution and not Botox. And the problem was two humungous, painful zits that just wouldn’t go away and were impossible to camouflage with even industrial-strength makeup. Plus, I had a huge ‘do to attend in about three days and a pimply, bumpy face is definitely not the best networking accessory! So, as a last resort, I made an appointment for a cortisone shot. Which brings us to the question: What exactly is a cortisone shot with reference to beauty? Intralesional corticosteroid injections – often simply known as steroid or cortisone shots – are used to treat deep papules, nodules or cysts that go down into the deep layers of the skin and are hence resistant to topical treatments like benzoyl peroxide or tretinoin. These pimples are often painful, can take anywhere between a couple of weeks to three months for healing and leave scars. To counter these, a dermatologist can inject a diluted corticosteroid (cortisone is a natural chemical which is released in our bodies to tackle inflammation; it should not should not be confused with “anabolic steroids”, which are drugs used for increased strength and muscle size) into an inflamed pustule. This speeds up healing and dramatically reduces inflammation. Over the next 72 hours, the blemish softens and flattens out by 40-60%. Most lesions heal within a week after treatment. 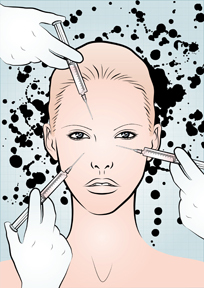 Corticosteroid injections also lessen the chance of developing scars. This is especially valuable if you are prone to scarring or hyperpigmentation. These are unusual, but the most common one is a “sunken” appearance where the pimple used to be. This is temporary and usually vanishes within a month. Ok, science lesson over – back to the real world. Knowing how squeamish I am about pain (and about syringes coming into my face! ), my doc first numbed the area with chilled ice water. Then, she injected the spot with cortisone and quickly followed up with another ice pad. It wasn’t that painful, though I did let out a few yelps and did not think it was the most comfortable sensation. Good thing is that the whole matter was over in about 20 seconds and there was no pain afterwards. All I had to do was take an anti-histamine and then go about my day as normal. The cost? Around US$125. By nighttime (roughly six hours after the shot), I had some redness at the injection sites. By the next morning, the zit was much less obvious and the cystic pain had vanished. A day later, there was almost no sign of the blemish – and none of the scarring that I had suffered from similar monstrosities in the past. What about you? Have any of you gotten cortisone shots? Or dealt in any other was with a pimple that was so bad you started to panic? Share the details so others can benefit from your experience! I have had cortisone shots on my shoulders but for a condition called Keloids. Raised bumps – external scar tissue. Painful but it helps. I doubt will do this though. Have discovered an amazing Ayurvedic cream that has made my zits disappear. At barely Rs 300 a month. What cream is that? Would love to try it! Good option next time I need to get rid of them! I can’t deal with cystic acne… can’t pop them, can’t pick them, can’t get rid of them! Exactly! And it’s so tough to cover them with makeup. Plus when they do start going away, the skin on that site becomes super-dry and flakey. Have you also had this experience? I am in India (Mumbai right now) travelling from Canada. I’ve never had a cortisone shot in the past but I think I need it now for a cyst I’ve developed on my chin. Do you know how I can go about finding a good doctor to do this? You should go to Dr. Jamuna Pai’s clinic – she is one of the best in India. Call up 67431712 or 23638699 and ask for Binny. Tell her you got the recommendation from me and she will try and slot you in asap. They have clinics both in town and the suburbs, so you can also ask her which will be closest to you. Hope this helps! The cortisol shot is so eeffective, I tried it whenever I have Diamond peel Session. My pimples really subsides within the next day.. I had a similar experience 3 years ago. I ended up getting it filled in with a dermal filler. How did it turn out and did the neosporin help? I just got a cortisone injection but am more worried about the redness and discoloration around it as it is on my cheek? I thought cortisone was used to treat arthritis! It was invented by Dr. Percy Lavon Julian and when did they start using it on acne? Hey there! I wanted to share my experience to let people know that everyone reacts differently. I decided to post on this page because when I got my first cortisone shot I used this page as a reference guide multiple times and found it very helpful, but I had the wrong expectations! I had a cortisone shot mysel, on my fore head area in early Dec 2015 an I’m going crazy it left a “sunken so of speak on my forehead.. hope it goes away!! Someone help! Do u know someone who can inject a cortisone shot in Jalandhar Punjab ? I lived in Maryland n close to Washington DC area. Need your advise where can I get cortizone shot for acne ? Name of derma doctor is doing it? Thanks and appreciate if anyone who know n share? I have roses is and am pregnant. I can not take my meds to control this. I have a huge cyst on my chin that is larger than a quarter and swollen. And at least 10 small pimples clustered right there together. I had my first cortisone injection on Thursday and it did diminish some but today is Sunday and still incredibly swollen and very painful. Can another shot be administered into the same lesion? And how soon after? I’ve tried everything to keep Rosesia under control but have had nothing but problems for the last few months.